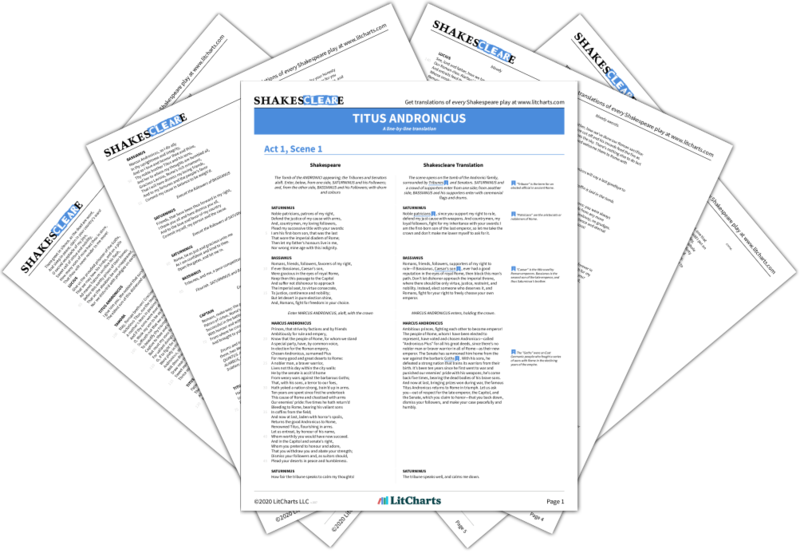 Instant downloads of all 942 LitChart PDFs (including Titus Andronicus). New! 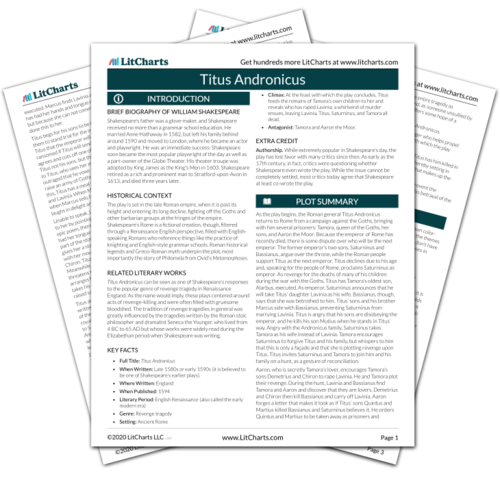 Understand every line of Titus Andronicus. 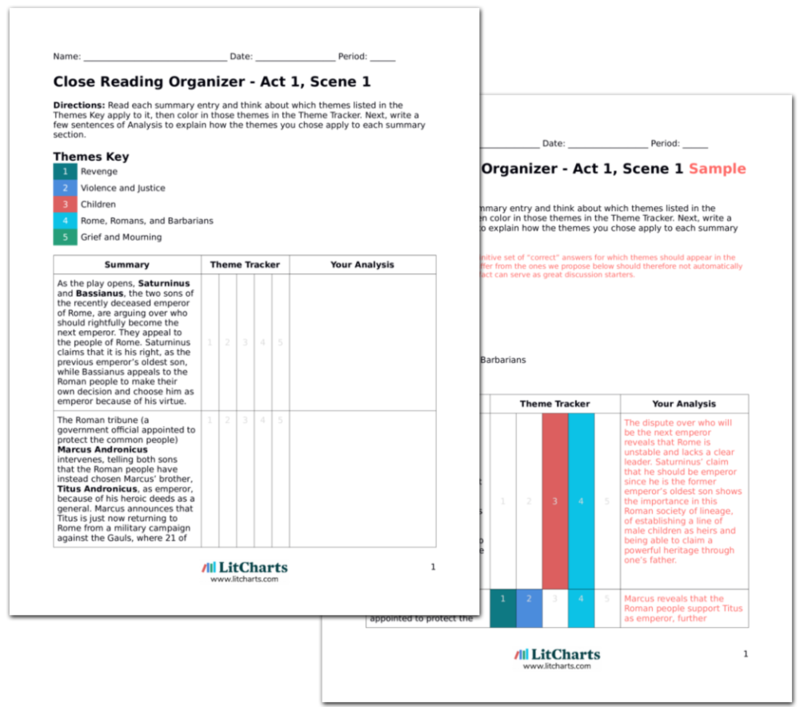 LitCharts assigns a color and icon to each theme in Titus Andronicus, which you can use to track the themes throughout the work. Titus, Marcus, Lavinia, and Young Lucius (Titus’ grandson, the son of Lucius) are eating dinner. Titus laments the fact that Lavinia and he have lost their hands. He attempts to interpret Lavinia’s gestures and claims to speak for her, saying that she will drink nothing but her own tears. Titus says that he will learn to interpret and understand Lavinia’s gestures as a kind of sign-language. While Titus clearly cares for Lavinia, he continues to objectify her, in a sense. He speaks on her behalf and claims to interpret her gestures, using her as a way to continue his own proclamations of grief and not allowing Lavinia to attempt to express herself. As earlier in the play, Titus tends to value his children greatly, but only as reflections of himself and not necessarily as persons in their own right. Marcus kills a fly, which upsets Titus, who thinks of the pain it would cause the fly’s parents. Marcus responds that the fly was black, like Aaron. Titus cries out gleefully and tells Marcus he was right to kill the fly. He grabs a knife and tries to stab the fly again and again. Marcus thinks that Titus has gone mad. Titus takes Young Lucius and Lavinia off to read them a story to distract them from their sufferings. At first, Titus responds to the fly’s death with empathy, the emotional capacity that might, earlier, have stopped him from having Alarbus killed despite Tamora’s pleas as a mother (and thus would have prevented Titus’ own suffering). However, Titus quickly lapses into vengeful thinking. Notably, it is the fly’s resemblance to Aaron’s dark skin—and thus a perceived ethnic difference between Titus’ Roman identity and that of barbarians—that stops him from feeling empathy. Fredericksen, Erik. "Titus Andronicus Act 3, Scene 2." LitCharts. LitCharts LLC, 26 Oct 2013. Web. 20 Apr 2019. Fredericksen, Erik. "Titus Andronicus Act 3, Scene 2." LitCharts LLC, October 26, 2013. Retrieved April 20, 2019. https://www.litcharts.com/lit/titus-andronicus/act-3-scene-2.